Which Punctuation Mark Didn’t Have A Dedicated Key Until The 1970s? Mixed Idioms With A Resulting Nonsenical Meaning Are Known As? 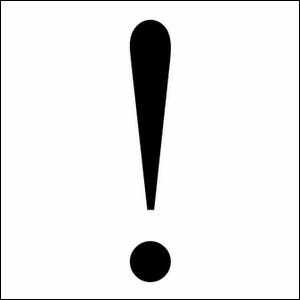 The exclamation point was introduced in the 15th century by printers looking for a way to denote a sense of wonderment, admiration, or exclamation with a punctuation mark. The mark itself is believed to be derived from the Latin io, which was an exclamation of joy. Over time, the “i” was placed over the “o”, the “o” shrunk in size, and by the time the printers adopted the symbol, they simply stylized the shape of it. The mark has remained in continuous use, although with variations in meaning and usage, ever since. Despite its lengthy history of use, it wasn’t until a century after the introduction of the typewriter that the exclamation point got a dedicated key. Prior to the mid-1970s, typists who wanted to insert an exclamation point into their text were forced to type a period, hit the backspace key, and strike an apostrophe over the period to form a makeshift exclamation point. Bonus Keyboard Trivia: Other characters that were, historically, given the cold shoulder by typewriter designers include the numbers “one” and “zero”. Early typists used the lowercase L and the uppercase O to denote 1 and 0.